Honey is one of the best natural beauty ingredients around. Honey is versatile, packed full of is antioxidants, antibacterial plus it also does wonderful things for all skin types. As honey is currently trending in the beauty world I thought it was about time I talked some of the best honey products out there. Of course, the natural stuff itself could do with a post all of it’s own but I’ll save that for another day! A complexion boosting mask which works wonders at restoring dull and congested skin all brightening up the skin. 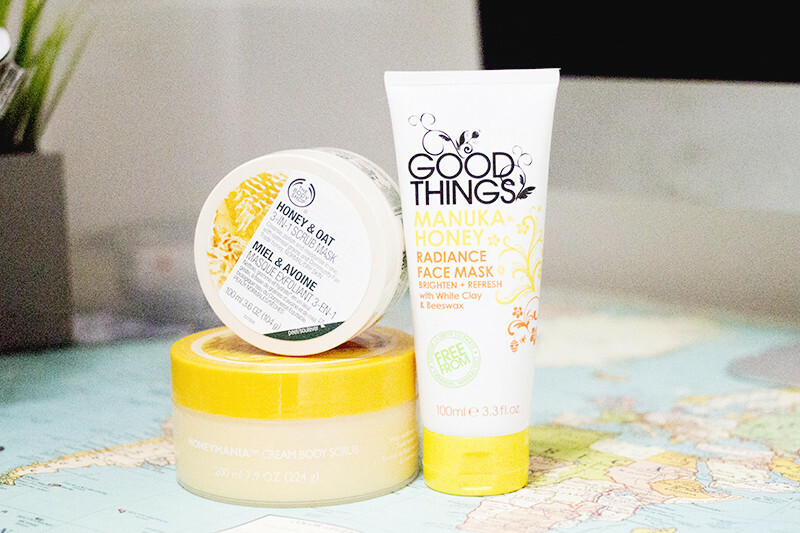 The mask contains a mix of Manuka Honey, Beeswax, Papaya Extract and White Clay - all super skin friendly ingredients which make for a happy face. Sourced from Fair Trade Honey in Bezamar in Ethiopia the Body Shop Honey and Oat 3-in-1 Scrub mask cleanses, polishes and moisturises normal to dry skin. It gently removes skin cells and refines, moisturises and conditions all at the same time. I love how good this smells, sometimes I have to stop myself from eating it out the jar! A mask and scrub in one that leaves the skin feeling super smooth and fresh looking from first use. This exfoliating body scrub has a rich scent and is made of Community Fair Trade Honey. It gently scrubs away dead skin cells and leaves a light floral sweet scent behind on the skin. My skin is left smooth but also quite moisturised at the same time as this is much creamier than your average body scrub. Definitely one for the sensitive skin types who find some body exfoliators too gritty, drying and harsh.